Thread: "Rosie the Riveter" ? The Pub is: Forum to generally shoot the breeze. It is NOT: a debate forum (NO Politics, religion, or controversial topics.) Keep it clean, fun and lite! Yesterday at the air museum, Amanda Goodheart-Parks, our Education Director, gave a talk on the background and interpretations of the WW2 "We Can Do It" poster. For most of my life, I'd seen the poster referred to as "Rosie the Riveter". Note that the poster makes no reference to "Rosie the Riveter". The poster itself was used only for a few weeks, back in 1943, just one of a series of internal posters to raise morale - and keep up production - in Westinghouse Electric plants. It was then filed away and pretty much forgotten. The poster wasn't well known by the general public until many years later, especially after it appeared in a Washington Post Magazine article in 1982 on war propaganda materials in the National Archives, then printed later on the cover of Smithsonian Magazine in 1994. But in 1942, a year before the Westinghouse poster first appeared, a popular song by Redd Evans and John Jacob Loeb hit the airwaves. 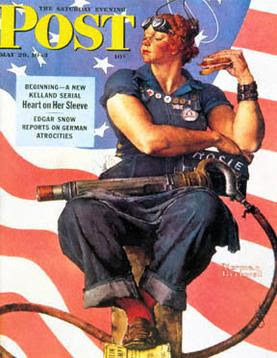 "Rosie the Riveter" described how women were taking the "tough" jobs men had done, so the men could head off to war. Note how Rockwell uses the name Rosie, and shows her trampling on a copy of Mein Kampf. 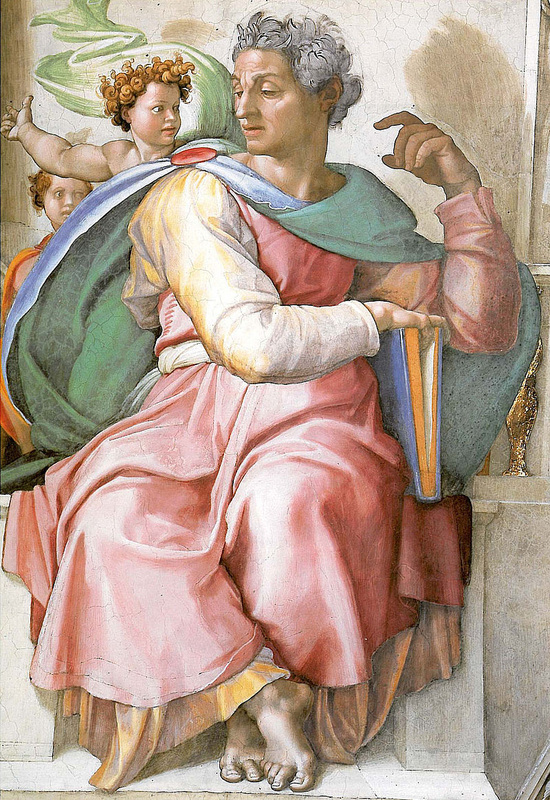 To add a religious connection, he imitated the pose of Michelangelo's "Isaiah". Lots more to the story, but you know me. I talk too much. We are very fortunate to have a strong education program, and Amanda at its head. History: 1976 MGB, 1959 Triumph TR3A, 1960 Mercedes-Benz 190b, 1958 Rambler American. Re: "Rosie the Riveter" ? No, seriously. I never would've made the connection to Michelangelo. I love stuff like this. Great post Tom. I know that I wouldn't want to run into Rockewell's Rosie in a dark alley. Although not a riveter, my Mom worked machining valves at Pratt & Whitney in E. Hartford during the war. Dad worked there too as an engine tester. Think of what our country is capable of with a common goal that everyone works towards. The Rosie the Riviter National Historic Park is out here in Richmond. The oldest NPS Ranger works there and tells the story from her personal experience. I never even made the connection until recently. While my dad was in the south Pacific (1940-1944, CWO, Army, installing diesel generators and radar equipment), mom was building the Martin Mars out at Glenn L Martin in California. Wow. Thanks Mom and Dad!